knitting for good! - craftivism. In the last five years knitting has undergone a complete transformation. Once considered a grandmotherly craft, knitting is now embraced by new generations of young, socially and politically conscious crafters. For these new knitters, their craft represents much more than the finished project; their knitting is a way to slow down in a fast-paced culture, subvert producers of mass manufactured merchandise, embrace the domestic, connect to people in their community, support communities across the globe, and express their own personal style and creativity. 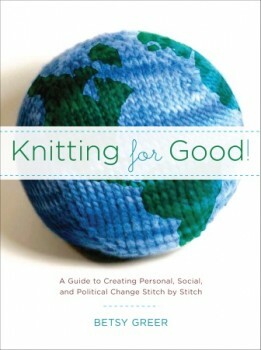 Betsy Greer, creator of Craftivism.com, has written the handbook for this new culture of knitters. By highlighting the subversive, revolutionary, and political aspects of knitting, Greer shows readers that knitting can be a profound way to: connect to ourselves by embracing the personal and meditative aspects of knitting; reach out to our community through sharing our skill and through charity knitting; and support others across the globe by using knitting as a form of activism and expression.She offers musings, thoughts, tips, stories, and step-by-step projects, all in support of the belief that every time we knit we have the opportunity to create positive change in the world. Knitting for Good! will be published by Shambhala November 11 in the U.S. and December 1st 2008 everywhere else.